Today we are very pleased to provide some benchmarking data for uninstall rates in the app industry. These data are from our new uninstall attribution offering, which debuted in January. Mobile app marketers are focusing more of their attention on the quality of users they attract with their install marketing campaigns. One of the key ways to get at user quality measurement is to understand how many people uninstall an app soon after the initial download. In other words, what percentage of installers get rid of the app soon after download? For many mobile app marketers, it has been difficult to calculate uninstall rates, because the leading mobile app measurement solutions historically did not offer a means to determine whether or not an app had been uninstalled. While standalone mobile app uninstall measurement platforms have existed for some time, relatively few mobile apps have adopted such technology. 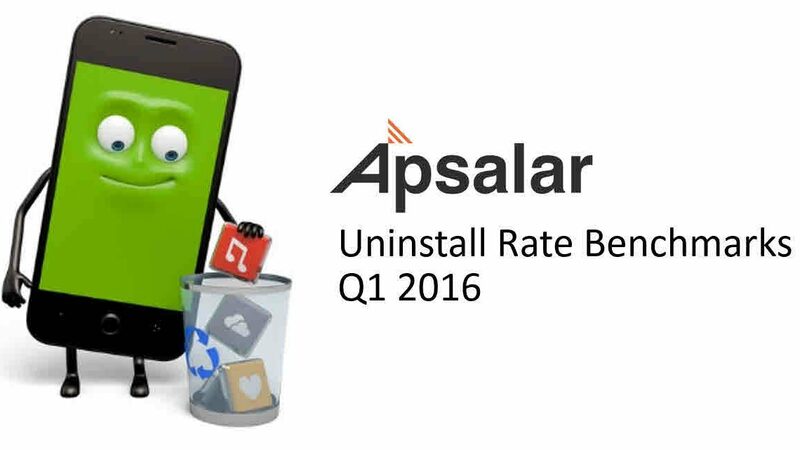 Apsalar changed the dynamics of mobile app uninstall rate measurement in January, 2016, when we launched uninstall attribution to our popular mobile app analytics platform. The overall uninstall rate for an app across the entire business. The uninstall rates for specific aspects of a marketing program, such as individual campaigns and executions, media partners, regions and cohorts. Granular uninstall measurement enables a marketer to collect diagnostic information that can be relevant to improving return on ad spend and key revenue metrics. Marketers are most interested in understanding and mitigating uninstall rate problems in the first weeks of a customer engagement. Most data show that after a few weeks, user behavior is mostly set for the long haul. Apsalar has chosen to initially develop four-week uninstall benchmarks as a means of ensuring that we can provide sound data for this new area of measurement for the industry. As adoption of our uninstall attribution measurement product continues to grow in the months ahead, we will expand our benchmarking. One major reason why rates are higher in India and across APAC is that in many Asian markets, consumers prefer less expensive phones that have much smaller memories. When a smartphone has limited memory, users must sometimes uninstall apps in order to make room for others. Even though they may still like the uninstalled apps, and may plan to install and use those apps again, the rates for uninstalls naturally tend to be higher in those regions. The area where we saw the largest variances from the industry norms were when we analyzed uninstall data by vendor. We examined uninstall rates across the top 30 vendors (as measured by their share of total installs in the Apsalar footprint) and saw rates that varied from an impressive low of 12% to an eye-popping 78%. This massive range underscores the need to measure uninstalls and to ensure that all of your partners are driving QUALITY users to your business. Think of install rates as a means of investigating a potential issue. All marketers know that their focus for marketing effectiveness measurement should be on maximizing KPIs. Orders, revenue, engagements, whatever the key metric. Optimizing uninstalls isn’t an end but rather a means to an end. Benchmark! First, identify your benchmark for uninstalls by measuring them for at least a few weeks across your entire plan. Paid/organic, all sources, all campaigns. Because our methodology is different, the benchmark figure may be different from the aggregate figure you see in the Google Play dashboard. Look for KPI Shortfalls: Then examine your program elements that display a major difference in performance against a KPI, like a much lower ARPU rate. Use Uninstall Data to ID a Potential Reason for a KPI Variance: When you identify a KPI problem area in your plan, look to uninstall rates and their variances versus the benchmark as a potential indicator of the “why” you’re coming up short on your KPIs. High uninstall rates can certainly impede your ability to drive revenue, but keep the focus on your KPI(s). a. They might be using target audience parameters that require adjustment. b. An individual publisher may be causing the issue. c. If you are using multiple buying models with that vendor, a shift in allocations may be justified. Think Long-Term: When you examine uninstall rates across campaigns or sources, take a long view. Daily variations are normal. Share and Grow Together: Work with your partners to improve performance against KPIs by sharing relevant uninstall insights. Uninstalls can be one indicator of how they can improve your results. Soon we hope to expect to be able to provide iOS uninstall benchmarks as well. In the meantime, we hope these Android uninstall benchmarks will help you better understand the relative performance of your apps on this critical dimension.